The player will be pleasantly surprised at how cozy and comfortable this place is. 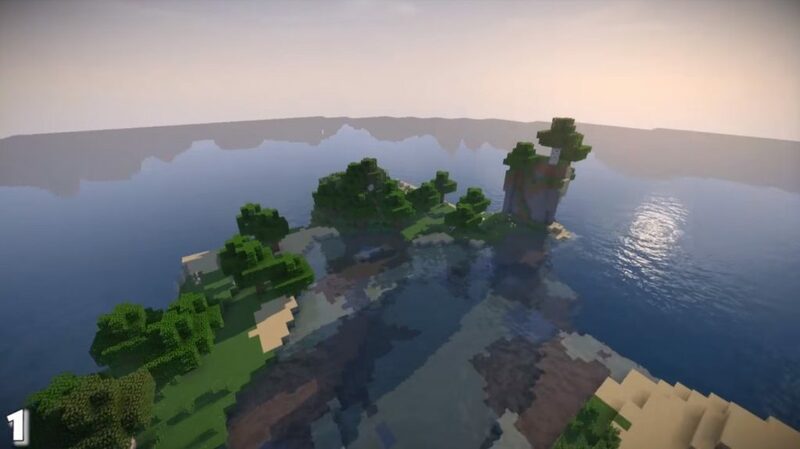 If you are tired of crafting swords, building powerful armor on a fast hand and exploring new biomes and space in the MCPE, just leave all the usual activities for a while and go explore the unique landscape for Minecraft PE 1.2.0, 1.2.6, 1.2.7. Immediately after the spawn you will see a large and very dense forest. Do not rush to go there, admire around. In the real world, you can rarely see such beautiful places, and if there is something similar, then in order to see all this, you have to go far and search for beauty. In Minecraft Pocket Edition, this is all already created for you! You just have to enter the coordinates (-901308900) and spend your leisure time cool. Invite your friends and admire unique places with them. Before visiting, you can select new textures and make some other changes (if possible). What is special about the seed to a unique landscape? After a couple of minutes, as you look around, you can go to the forest. There, in addition to trees, there is a lot of other beautiful vegetation, flowers, shrubs and unknown grass origin. There is even a pumpkin! It can be used as a preparation of delicious and nutritious dishes and thereby restore the lost energy. After you explore the forest, go on to Minecraft Pocket Edition, a very long and picturesque river flows there. Near the coast you can find a small but flat place and build a house for living there. Seed on a unique landscape 1.2.0, 1.2.6, 1.2.7 will also allow you to enjoy other beauties – these are the hanging mountains, unique types of coniferous trees that grow on the very tops of these mountains. How is this possible? There are other cool buns in Minecraft PE!